This is the second book in “The DNA Detectives” series written by Dr. Mandy Hartley. They are the first ever children’s fiction books for 7-12 year olds where the characters in the story use DNA and forensic science to solve a crime. This is the second book in “The DNA Detectives” series written by Dr. Mandy Hartley. 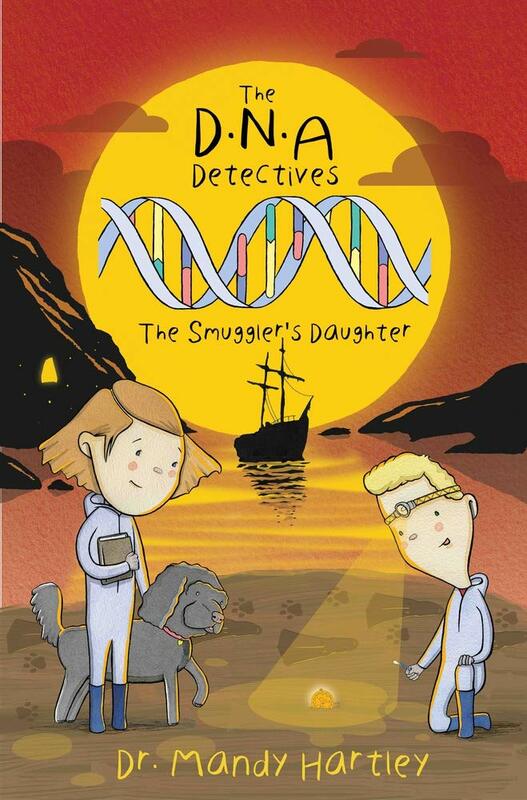 They are the first ever children’s fiction books for 7-12 year olds where the characters in the story use DNA and forensic science to solve a crime. The books have been written so children are learning about DNA, cells and forensic science as well as enjoying the exciting adventure. In this book children will discover how DNA can be used to unlock questions about the past and present. They will discover how DNA is inherited, how we can use DNA to find out where someone originates from and to establish if they are related. The story is set in a beautiful seaside cove in Cornwall. According to the records it was once rife with ship wreckers and smugglers, there are rumours of a secret smuggler's tunnel, but no one has ever found it. The characters in the story, Annabelle and Harry are determined they are going to find the tunnel! During their search they discover a gold locket in a rock pool. Inside the locket is a photo of a girl and a lock of hair. When they show the locket to the lady in the cafe she remarks It must have been left by the smugglers! ... and so starts their most exciting adventure yet! Join Annabelle and Harry to see if they can discover the identity of the girl in the locket. Can they find the smuggler's tunnel? Find out how they use DNA to unlock questions about the past? Children reading this book will learn about DNA, cells and forensic science. They will discover how DNA is inherited, how we can use DNA to find out where someone originates from and to establish if they are related.